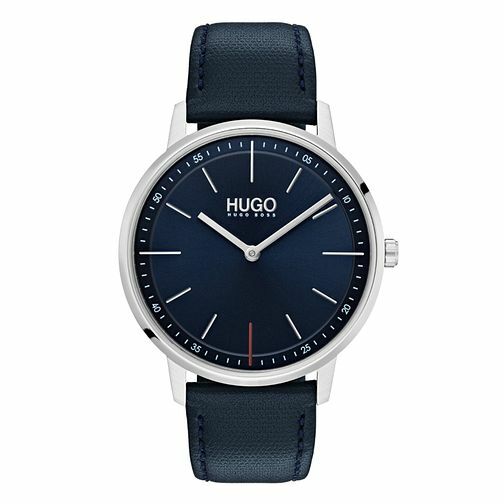 This sleek mens EXIST watch by HUGO features a blue leather strap and a 40mm stainless steel case with blue sunray dial. The dial is complete with markers, and a coloured marker at 6, helps it to stand out from a classical timepiece. It is water resistant to 30m and comes with a 2 year international warranty. Hugo Exist Men's Blue Leather Strap Watch is rated 4.7 out of 5 by 3. Rated 5 out of 5 by Anonymous from Designer steal! I bought this watch as a gift for my husband and couldn't believe it was so stylish for such a great price And a well known designer name too! My son has now informed me that he would like one too! Very pleased with it - very smart for work or leisure time and would definitely recommend as a gift.